"This is a healthy dessert recipe that you can make for kids who don't eat carrots. Substitute carrots with beetroots and you get Beetroot halwa." In a saucepan over medium heat, combine carrots and milk. Bring to a boil, and cook until most of the milk evaporates, about 10 minutes. Stir in sugar, and simmer until mixture becomes dry. Stir constantly to ensure that it doesn't burn. Remove from heat. Melt butter in a skillet over medium heat. 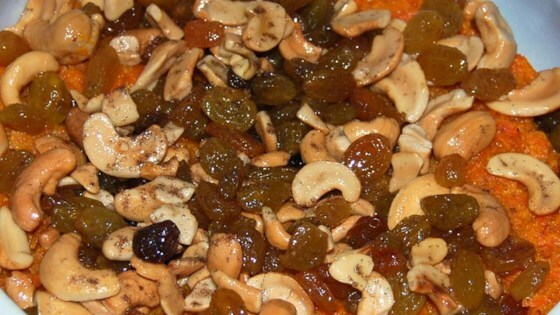 Stir in cashews and raisins, and saute until cashews are golden brown. Spread over carrot mixture. Sprinkle top with ground cardamom for fragrance. Some people puree the carrots, but grated carrots give a nice texture to them. My entire family fell in love with this recipe, even my father who hates carrots. It is sweet and easy. I whipped it up in a few minutes and it was great cold the next afternoon. Instead of regular milk & sugar, I used a 14 oz can of sweetened condensed milk. Cooking off the liquid still took 45 min. Everyone liked it though. This tasted great, but it took me a couple HOURS for the liquid to evaporate. Even then, it was still a little "wet".